Paul Resika, a painter whose vision combines lyrical color, glorious brushing, and bold simplification, is one of the last surviving lions of the New York School. Born in 1928, he was trained by Hans Hofmann during his teenage years and mounted his first one-manshow in Manhattan at the age of 19.Although he chose not to be quoted directlyfor this article, the artist recently spoke fondly about the small size of the art world in the late 1940s and the way in which it was possible to meet all the poets and painters in very short order. He remembers meeting De Kooning before the great painter ever had an exhibition, and he describes his own role as that of a green kid who had none of the years of work that the Abstract Expressionists had behind them. In spite of his early success, Resika felt he needed to find his own voice and very quickly turned away from abstraction to work on representational paintings. Living in Europe for a while, his early landscapes were heavily influenced by Corot and were created using a quiet tonal palette. Still, the artist retained the forthright and sometimes risky brushing of the Abstract Expressionists. His work involved making series of paintings based on a small number of motifs, a strategy he has pursued throughout the many incarnations that his work has taken over the years. The influence of later French painting gradually began to make itself felt in Resika’s work. The vibrant color and elegant taste of such Fauvist painters as Albert Marquet (1875–1947), Kees van Dongen (1877–1968), and Raoul Dufy (1887–1953), encouraged him to try a bolder palette. The 1977 painting Dragon Dune presents the world with a pink sky and orange sand backed by subtle greens. Working directly from nature, the artist concentrates on his own response rather than the appearance of his subject. The exaggerated color and strong brushing become expressive tools launched into action by the suggestive power of the view. Another motif Resika took up in these years was a collection of farm buildings that once belonged to the Marquis de Sade. Sitting together like the bare bones of some classical composition, they are surrounded by the impossibly rich greens of a fantast’s French countryside and backed by a luminously blue sea. In the 1980s, Resika discovered a new motif close to his summer home on Cape Cod—the squat rectangles of the pier buildings on the seafront at Provincetown. In Provincetown Pier, 6th October, the artist reduces his motif to a near abstraction, presenting the pier buildings as almost drab grays against a luridly vibrant orange-and-yellow sky. The sea in the foreground seems to act in a completely different world, sitting quietly in a resonant violet-blue. The effect is achieved with fearlessly direct brushing delivered with masterful assurance. Exhausting his interest in the piers, the artist eventually turned his brush to groupings of small boats in the harbor, garnering combinations of powerful geometric shapes isolated in the surrounding fields of color suggested by the sea and sky. In Vessels No. 19 he finds a way to hang a heavyblack together with brilliantly saturated red, green, andblue shapes over a transparent red ground. Once again, the brushing is utterly decisive and the effect conspires to be both monumental and lighter than air—a pleasure made to last. In the early 2000s, Resika once again made a radical shift in his work. Inspired by landscapes in both Maine and the Caribbean, as well as the coast of Cape Cod, he began to make pictures of a more assertive geometry. In 2007’s Dark Island, we now find a clearly defined line around everything and forms are simplified to an almost harsh angularity. Triangles dominate, and the suggestions of aplanar structure seem to hark back to some of the strategies of the Cubists. The color palette has shifted, too, with the artist now content to allow large sustained fields of singing, saturated hues to envelop the painting. Blue Wave follows a similar strategy. The composition is elegantly locked together, with the surprising angle of the wave carrying its abstract sailboat in an aggressive tilted movement against the quieter angles of landscape and lighthouse. 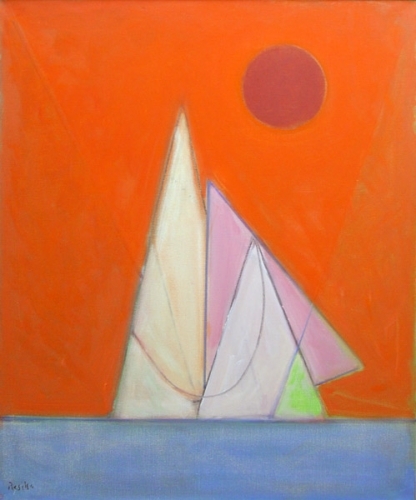 Later paintings are still more abstract, and in Red Passage the sailboat, sea, and sky seem immersed in a richly quiet dream under an improbably violet sun while all the warms of the picture are activated by a single green triangle at the prow of the vessel. A passionate artist, Resika is not shy in expressing his views on art and artists. He decries the way in which the current art world ignores the pleasures of some of the painters he most admires. Dufy, Marquet, and Van Dongen are given short shrift by modern curators while much that is merely pandering and gratuitously provocative gets attention and draws crowds. He speaks with glowing enthusiasm of a recent exhibition of late Renoir paintings, and praises his contemporaries, such as Paul Georges (1923–2002) and Leland Bell (1922–1991), whose work seems to have slipped from view in recent years. Still, Resika has succeeded in having a considerable influence on younger generations, both through his work and through his time as head of the M.F.A. program at Parsons The New School for Design, in New York City. An ability to find a positive take on life seems to drive Resika’s art, a faith that the world will always present something new and wonderful, that making a change is always worth a risk, and that every brushstroke might yet provide some kind of marvelous revelation.